Two weeks ago, Taiwanese chip designer MediaTek invested $60 million in One97 Communications, which runs Paytm, a mobile wallet platform and an online shopping site. In itself, the transaction is not unusual â€“ Paytm is raising funds for growth and MediaTek is known for backing innovative firms. What makes it interesting is that the investor had barely three months before had backed Paytm's arch rival, MobiKwik. So, since May, MediaTek has backed India's top two digital wallet companies. Is there any reason for the two investee companies to be alarmed? For now, MobiKwik has brushed aside any concerns. "MobiKwik is MediaTek's only direct investment in India, and the funding in Paytm is being done through Mountain Capital Fund LLP, where MediaTek is one of the partners," a MobiKwik spokesperson told TechCircle. "All said, an investor is free to make investments in any company he wishes." MediaTek owns a 98% stake in Mountain Capital Fund, while the remaining is held by other partners. This clearly makes both MobiKwik and Paytm as direct competing investments made by the chip firm in India. While investments in two rivals do give a confusing sign to the market, MediaTek-MobiKwik-Paytm is not the only peculiar case. There are several marquee investors who have made competing investments, hinting at an interesting—and rather confusing—trend in the India's startup ecosystem. For example, US hedge fund titan Tiger Global has bet on India's leading e-commerce players Flipkart and Shopclues as well as the parent of their rival Amazon. Sequoia Capital invested in Grofers and PepperTap. The two were once direct e-grocery rivals, though PepperTap is closed now. 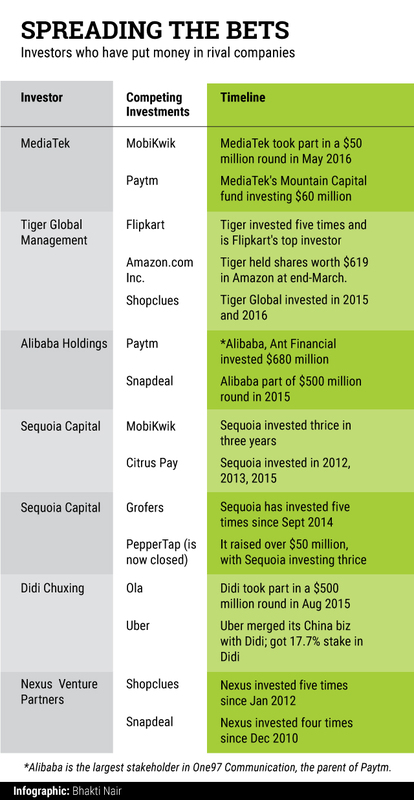 Alibaba's bets on Paytm and Snapdeal bets are also somewhat similar, and the list goes on. There are several reasons for an investor to back multiple players in an industry. It could be a function of the fact that a clear leader has not emerged and the market is large enough to accommodate several large players. This is what can called as a 'safe play' in industry parlance. The other angle is that of consolidation, which cannot be ruled out if one looks at several merger and acquisition transactions in the past. In January, online classified portal Quikr acquired real estate portal CommonFloor for $200 million. The transaction was blessed by their common main investor â€“ Tiger Global. The game-changing Flipkart-Myntra transaction in 2014 also involved common investors Tiger Global and Accel Partners. Ola and Taxi4Sure, who joined hands last year, had Accel Partners and Sequoia Capital as common investors. Ola, however, has now shut down Taxi4Sure. "There is distinctly a probability of an M&A in the event of things falling flat or one investment doing well and other not doing well or both grow and to keep out the third competitor you merge them and make them much bigger," said Deepak Natraj, managing director, Aarin Capital, an investment firm. Scale is also an important factor, believes Anil Joshi, managing partner, Unicorn India Ventures. "When things are going good nobody would be complaining, but when the chips are down, the scale could always be achieved by integrating both the investments." He adds, "Largely, VCs avoid investing in competing businesses as they want to back their own winner because ultimately you will be fighting against your own money." Industry observers also say the Indian investment market is nascent and investors want to make multiple bets to ensure they have several opportunities to grow. "They don't mind being an investor in competing companies because there is room for both companies to grow. However, for some investors it's a strategic play. For those investors, being present in all companies is important," said Joshi.